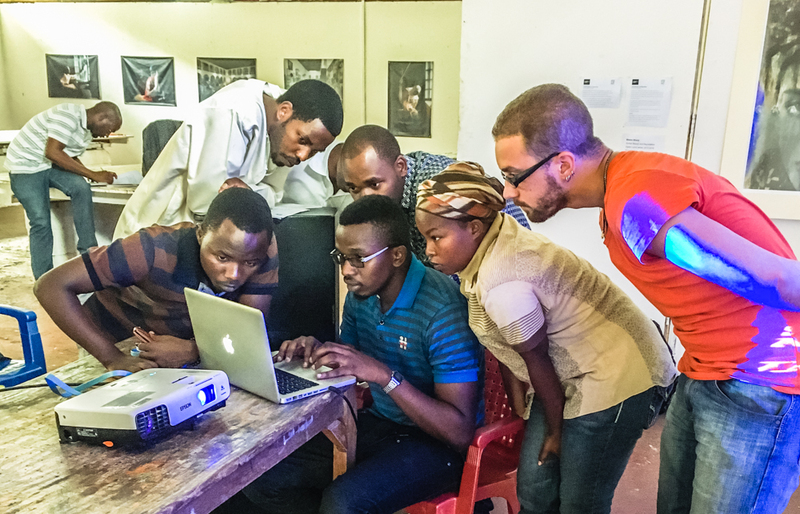 This past August we facilitated a truly fantastic workshop series at Nafasi Art Space in Dar es Salaam, Tanzania. One of the premiere centers for contemporary art in the country, Nafasi Art Space hosts a myriad of art-related events, including exhibitions, film screenings, concerts, performances, artist “hangouts”, professional trainings, and workshops, like our own. In addition, their impressive campus houses over 32 studios, utilized by more than 60 member artists. These workspaces, most of which are actually made from huge, metal, freight containers, are arranged in a roughly semi-circular formation around the campus. 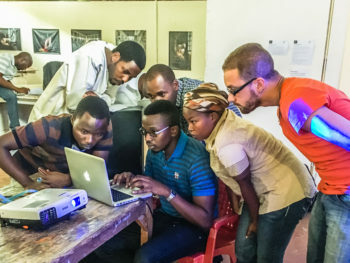 This configuration, along with the collaborative ethos of the organization, itself, creates a unique feeling of shared space at Nafasi, where artists can constantly be found interacting, sharing ideas, collaborating on projects, and also socializing together. A panorama of the beautiful Nafasi Art Space campus in Dar es Salaam, Tanzania. The cohort of participants that we had in this workshop series was unusual in that the vast majority already had a high level of experience in media making. Indeed, some were already professional filmmakers and videographers, while the rest were largely university students, studying film, graphic design, or multi media. The group was also unusual in that it was very large, consisting of around 18 individuals (normally in our workshops we have 10-12 participants). Knowing that it would be a challenge to work with a group this size, I immediately sought out the assistance of two of Nafasi’s member artists, who work as professionals in the field of film and video production, Abdallah Mambia and Nkumi Mtingwa. 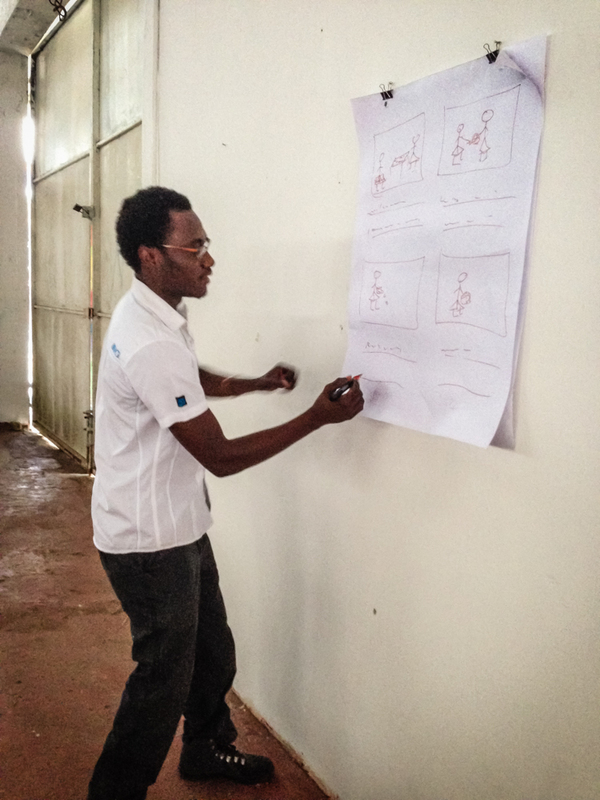 Facilitator, Abdallah Mambia, draws an example storyboard on day two of the workshops. On the first day of the workshops, where students choose, discuss, and refine the topics for their documentaries, we broke the class into two groups, with one facilitated by myself, and the other by Abdallah, who really saved the day. On the second day of the workshops, Abdallah continued his strong contribution by doing a presentation on storyboarding, a key component of pre-production. Storyboarding is a way to plan, organize, and truly “pre-visualize” a film, by drawing a sequence of cells representing the various shots that will appear in your intended motion picture. The resultant storyboard looks much like a rudimentary comic book, and serves as a blueprint for the filmmaker as she/he approaches their shoots. Coming more, myself, from a tradition of observational cinema (in which one lets the story, more or less, unfold naturally before the camera), storyboarding was not one of my strengths. Yet I have come to find that developing this skill can be extremely beneficial, and especially to beginning documentary filmmakers, to help ensure that they go about their first projects with a clear, and visual, plan. 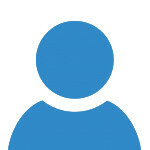 For this reason it was wonderful to collaborate with Abdallah, whose capacities complemented my deficiencies. And based on what I’ve learned from him, I plan to introduce and utilize the concept of storyboarding in future Bent Marble workshops. Let’s hear now from Abdallah, himself, as he talks not only about the importance of storyboarding, but also about that of documentary filmmaking, as well as his overall experience of the workshops. In a subsequent workshop, another Nafasi member artist, Nkumi Mtingwa, who specializes in animation and visual effects for film, did an outstanding presentation on using motion graphics to “add value” to one’s documentary productions. This included specific techniques to add motion to photos and titles, as well as methods of “branding” one’s film, through designing custom motion graphic elements. What was intended to be a mere one-hour lesson, was so captivating and relevant for this class of advanced learners, that Nkumi ended up teaching for the entire three-hour session! And the footprints of the professional concepts that Nkumi taught can be seen in the students’ final films. So let’s hear from Nkumi, in his own words, as he elaborates on the benefits of using motion graphics, as well as discusses the recent growth of the documentary genre in Tanzania. Notably, as the workshops progressed, several of the participants, themselves, also stepped to the plate (or the laptop in this case), to share what they knew on topics ranging from cinematic depth of field, to color correction, to audio noise reduction. All in all, there was probably more sharing of knowledge, and indeed of the very role of instructor, in this workshop series, than in any other to date. And I strongly feel, because of this particular cohort’s high level of media making experience, that this practice served to maximize learning and intellectual engagement for all. As an interesting side note, my living arrangements in Dar es Salaam also had a significant impact on the workshops. In order to keep Bent Marble’s costs down, we now ask that our organizational partners provide us with housing for the duration of our workshops. Nafasi Art Space graciously put me up in their guesthouse, which is located in the nearby neighborhood of Mwenge. There, my roommates were Nafasi Program Assistant, Nicholas Kimaro, and South African visiting artist-in-residence, Francois Knoetze. Living with them was a great opportunity to have some immediate friends in this giant megalopolis, as well as people with whom to share meals and spend free time. Interestingly, both of my flatmates ended up playing an important role in the workshops too, as Nico (as Nicholas prefers to be called) made sure our projector and incredibly heavy sound system were setup and functioning each class day. And Francois, himself a talented video artist (in addition to costumer designer and performance artist), presented one of his abstract, yet documentary-esque, pieces to the class, to help expand their minds as to what constitutes a documentary. So once again, the sharing of space led to kindly collaboration and fruitful results in Dar es Salaam. Have a look now through a photo gallery from our Facebook page that captures and conveys the entire process of these workshops… from day one, to the countless contributions of our co-facilitators, to the successful public screening event and awarding of certificates. Before signing off I’d like to offer a big, BIG thanks to Nafasi Art Space Managing Director, Rebecca Corey, Administration Manager, Maria Kessi, and their wonderful support staff and interns, for finding and enrolling an amazing group of participants, organizing and promoting our workshops and final screening event, giving us a cozy place to stay and lunch every day, and inviting us to come back again next year (hint, hint!!:). It was a really wonderful experience, with many, many new friends made from throughout the Nafasi community.